Flirt with fashion. 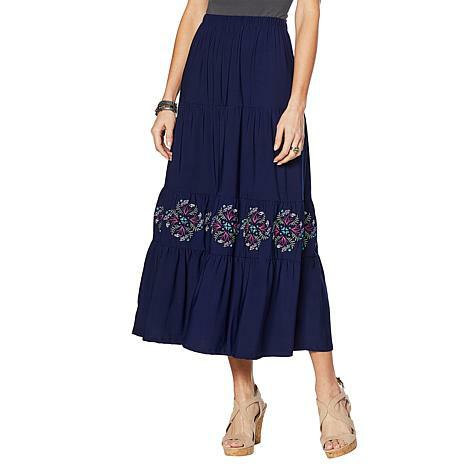 This feminine, tiered maxi skirt features detailed embroidery and a flowy silhouette that begs to be twirled and spun. The boho-inspired design is perfect with a tee or tank for casual company or a dressy blouse and heel can dress it up for evenings out. Thank you so much Antthony for offering petite plus lengths!!! 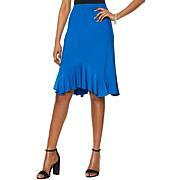 Thank you Antthony for this great new skirts , I order one black and one navy, with this I now have 6 of your wonderful, beautiful,and comfortable skirts, they are fantastic like all your fashions and YOU. I love you.Thank you. 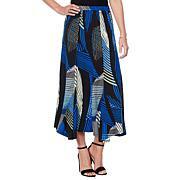 Awesome skirt, love the design. I originally ordered the petite small in black but had to exchange for petite extra small, already received and love it. Thank you for making petites! Additionally, love the exchange options of reordering right away without having to send item back first. Have not worn yet. 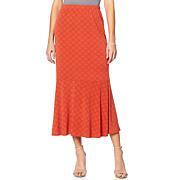 waiting for warmer temps, but like all of Antthony's skirts, fits perfectly, really pretty, love it! 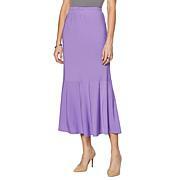 This skirt must have been made for a 10 foot person. Sent it back. So many reasons to fall in love with this skirt. The flat elastic back-waist and button front give you a comfortable fit while the rich, faux suede is warm and perfect for the cooler weather ahead. Top with blouses and add boots for an instant chic look.